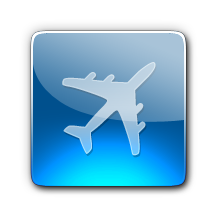 SANTIAGO DE ATITLÁN o que fazer, o que visitar, onde ir, onde comer, reserva de hotéis, aeroportos mais próximos, fotos, informação geral, dicas, etc. 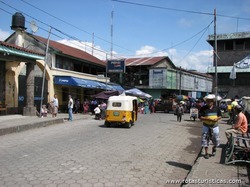 Santiago Atitlán is a municipality in the Sololá department of Guatemala. 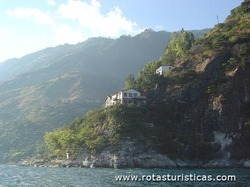 The town is situated on Lago de Atitlán, which has an elevation of 5,105 feet (1,556 m). 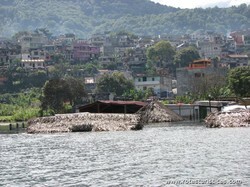 The town sits on a bay of Lago Atitlan between two volcanos. Volcan San Pedro rises to 2,846 metres (9,337 ft) west of town; Volcan Toliman rises to 3,144 metres (10,315 ft) southeast of town. 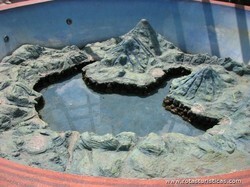 Volcan Atitlan, with a summit of 3,516 metres (11,535 ft), is south-southeast of town. 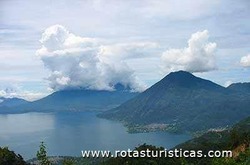 Santiago Atitlan is southwest of Panajachel across the lake. 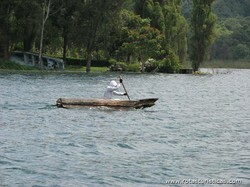 Major highways reach Lago Atitlan at San Lucas Toliman and Panajachel. A road links Santiago to San Lucas Tolliman. 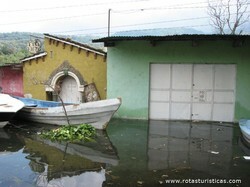 Boats connect the numerous communities around Lago Atitlan. 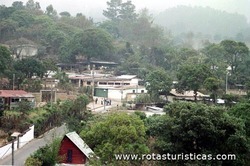 The majority of the residents are indigenous Mayans. It was the capital of the Tz'utujil people in pre-Columbian times and its name was Chuitinamit. This large church, dedicated to Saint James the Apostle, dominates the far side of the Parque Central, set back from it on the far side of an open space. It was built between 1572 and 1581, and has been restored and reconstructed several times after significant earthquake damage. 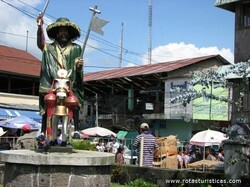 It has three altarpieces representing the three volcanoes that tower over the village. There is also an interesting pulpit (photo 5) which shows how the Roman Catholicism introduced by the conquering Spanish absorbed some of the local traditions. Note the quetzal sporting a halo, and above it the ears of corn – corn was sacred to the Maya. Along both sides of the church you will see wooden carvings of saints, each dressed in a fabric tunic (photos 3 and 4). These are made by local women and are changed each year. On the wall either side of the main door are some marble plaques that repay close reading. The one on the left as you enter tells the history of the village – its settlement by the Tzutuhil Maya from about 900 BC onwards, its conquest by the Spanish in 1524, the building of the first church in 1541 and of this later replacement. "From mid 1980 until late 1990 the people of Santiago suffered from the violence caused by the thirty year civil war waged in Guatemala from 1966 to 1998. Santiago Atitlán suffered a massacre on January 6, 1980. Ten men from the village were killed on that day by Guatemalan military forces at Chacaya about three miles from Santiago Atitlán. The men were working their fields when the surprise attack occurred. 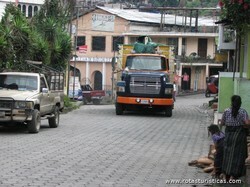 Death threats, woundings, disappearances, assassinations became common place in Santiago Atitlán at this time. This Catholic church served as a refuge for many families who came here each night to sleep in the safety the church offered. On July 28, 1981 Father Stanley "Apla’s" Rother, Catholic pastor of the church was assassinated in the parish rectory adjacent to this church. 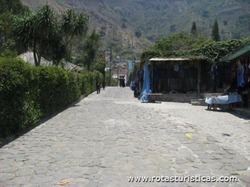 The people of Santiago Atitlán asked that his head and blood remain in the village. They are buried in the martyr’s monument in the south west arch of the church. The violence in Santiago continued through 1990 claiming a deacon and many other church members. On December 2, 1990 thirteen people were killed in front of the local army camp in canton Panabaj about one mile from Santiago. They went to the local military camp to protest an attempted kidnapping earlier in the day. The people of Santiago Atitlán organized peaceful protests after this massacre and the army left Santiago before the end of December 1990. The priest mentioned came from Oklahoma, and churches there have contributed to the memorial and supported this church. 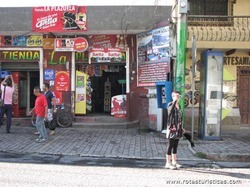 Towards the top of Santiago’s main street a left turn will take you to the market area. You can’t miss it – the stalls spill out on to the street and many traders simply sit at the edge of the street with their produce displayed on an upturned box or on a cloth laid out on the road itself. If you’re discreet with your camera you’ll be able to get lots of “local colour” photos. Most of the women selling here will be wearing the traditional local costume of huipiles embroidered with colourful flowers, but you may also spot a few who are obviously visiting from another village as their costume will be noticeably different – the blue stripes of San Antonio Palopo perhaps, or a red from further afield. I found that there were mixed attitudes to my camera – a few people seemed happy to pose, others needed to be caught unawares, and one man tried to charge me 10 Q just for taking a picture of some brightly coloured beans that weren’t even on his own stall! If you’re hungry you can buy some of the small sweet local bananas as you need have no qualms about eating these straight away – no need to wash fruit that can be peeled. There are also stalls selling ready-prepared slices of melon, cucumber and other fruit and vegetable combos in plastic bags, but I didn’t like to risk these. Beyond the market you will come to Santiago’s main square, called (like such squares in most Spanish colonial towns throughout Latin America) the Parque Central. Today it is a peaceful spot. A few old men dose on the benches, wearing their traditional short stripy trousers. 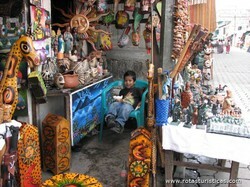 Children play, tourists pause to eat lunch, and women sell handicrafts or bananas. But on 1 December 1990 it would have been a very different scene, because it was here that local people (men, women, and children) gathered in their thousands to march to the nearby garrison to demand an end to harassment by soldiers stationed there. They had been spurred to action by an event earlier that day. Several soldiers from the garrison had been in town drinking and had got out of control. When they started harassing local women, some villagers threw stones at them. The soldiers pulled their weapons and fired, killing one of the villagers. When the group from the town arrived at the gates of the garrison they were met with gunfire. Eleven were killed and 40 injured. 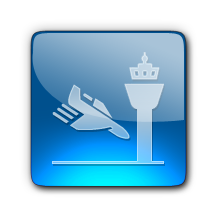 The incident caused a national outcry against the government and drew international condemnation. 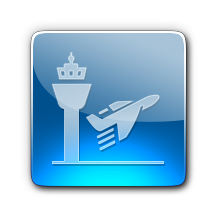 The government was forced to act against the military and withdrew them from the town. There is a full account of the 1990 uprising as told by a local here. Today the martyrs are commemorated by a monument in the church (see next tip), a Peace Park on the sight of the massacre, and an annual ceremony on the anniversary. The scene from this viewpoint is stunning for more than one reason. 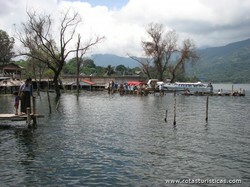 Below is the inlet of Lake Atitlan on which Santiago Atitlan is located. 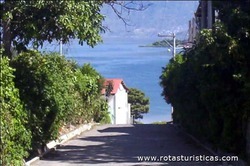 From the opposite shoreline one gets an incredible view of Volcan de San Pedro rising to an apex height of 3020 meters. Also below you will notice a cove protected by a point that juts out into the inlet. This cove has served as a Mayan bathing/clothes washing basin for centuries. Local women still come here daily to do laundry and to bathe. Please be discrete and respectful if there happens to be women bathing in the cove. 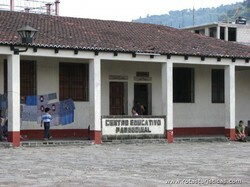 In late 1990 a local leader was taken into custody by the Guatemalan army. Villagers grouped together to protest and demand his release. Eventually the soldiers fired on the group of protesters resulting in the death of 13 people including at least one child. A monument in the form of a peace park (Parque de la Paz) has been built on the site of the massacre to remember the 13 persons who were killed. It is best if you can go with someone who can explain the details of the event which makes the park a much more meaningful place. 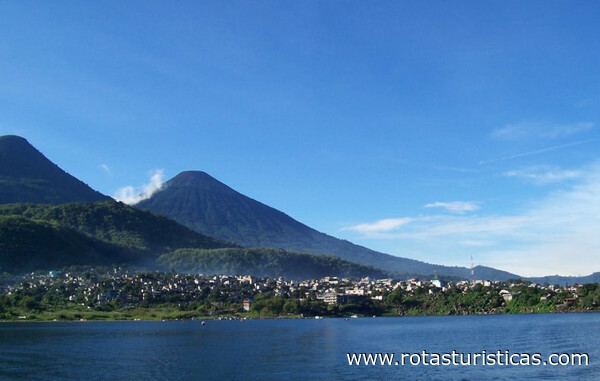 Around Lake Atitlán, the town of Sololá which is situated on a cliff high over the lake can be 10 or 20 degrees colder than the towns such as San Pedro la Laguna which are at lake level. 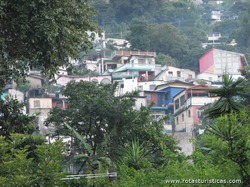 Although at times it gets cold in the night, the climate in San Pedro is generally mild. Cool in the morning and evening, but the temperature usually reaches 80 to 85 degrees between 11:00am and 3:00pm. I usually swim every day in the lake at 6:00am. I hate to be cold so if it was cold I would not do it. It is refreshing.